One important use for Infowise UltimateForms Voting Column that was briefly discussed in another article is the ability to give users the a chance to rank other user submissions. For instance, this can be extremely helpful in an FAQ scenario that we are about to discuss. Fequently Asked Questions are a a common use case in the SharePoint world. 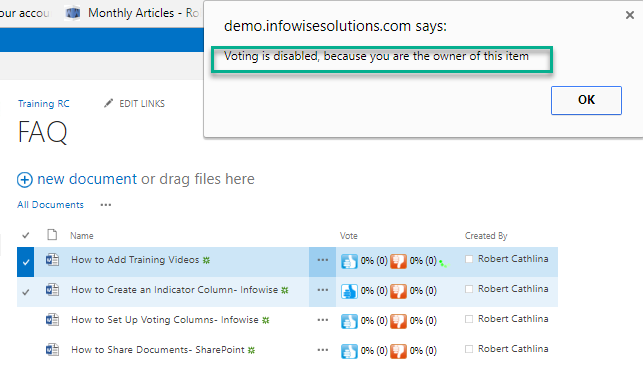 With the Infowise Ultimate Forms Suite, we can use the Infowise Voting Column to allow our user's the chance to vote on which FAQs they find the most helpful! There is one important feature I would like to call out when adding the voting column- the Owner column as shown below. 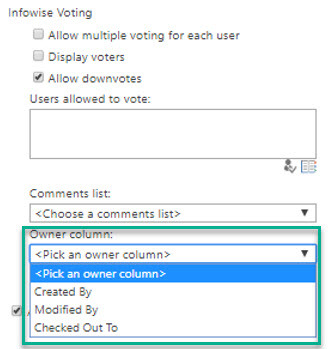 Infowise Voting Column allows us to use any Person or Group column type as the Owner Column. For our purposes, we can just go ahead and select the Created By column as our Owner Column. This feature is perfect for an FAQ library in that we can set it so that the owner is the person who uploaded the document. This would keep the creator of an FAQ from being able to vote on their own submission. If I try and vote on one of the FAQs I just created, I get the below error message. Limiting the ability of an owner to vote on their own document is essential to any successful FAQ library. The Infowise Voting Column allows us to select any Person or Group column as the Owner. This further allows us to dynamically set who can and cannot vote!